There are many causes of depression. This can be only a transitory feeling and withdraw spontaneously or the symptoms and signs may linger and even intensify over time. 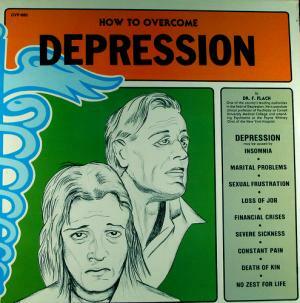 In case of clinical depression one requires professional help. On the other side, depression which does not seriously interferes in one's life and normal functioning can be treated with certain changes. For example, a person may go through depression due to a relationship breakup. Furthermore, a loss of a family member or a friend is always accompanied by certain extent of grief and depression. Students commonly feel depressed if they fail their exams. Loss of job is one more cause of depression. Apart from the previously mentioned there are many more causes of depression. No matter what the cause is the person must pluck up courage and try to overcome the problem. It is not easy to deal with depression. Many people simply cannot fight the horrible feeling and are prescribed certain medications. It is, however, essential to face the cause of depression and try to deal with it. Medications are only temporary solution and one has to acknowledge the exact problem and eventually triumph. The best thing in overcoming depression is to be with family and friends and have plenty of their support. The person should make certain life changes and engage in different activities which may effectively occupy his/her time and have positive effect on the overall mental health. The very presence of people is essential for dealing with depression. A conversation of any kind may distract one's thoughts and make him/ her feel better for a while. In some cases even serious discussion related to the problem with relatives or friends may be beneficial for people who feel depressed. The person is supposed to engage in new activities and hobbies. This way the attention is easily drawn away from the problem. The person may enjoy in a new activity and even start feeling positive vibes. Work involvement may have similar effect as new activities. Namely, if a person is occupied with work him/she simply does not have enough time to think about the underlying problem. What is more even interaction with colleagues may have some positive effects on the affected person. The effects are the most prominent if a person starts to learn new skills and experience professional progress. One may even set up new goals and try to accomplish them. By being engaged in this activity one may successfully overcome depression and all its negative effects. How to overcome driving phobia? How to get back on the road? What to do when depressed person doesn't want help?